Reserve Your Labradoodle Puppy Today! Contact us now if you would like more information or have questions not answered on our website. 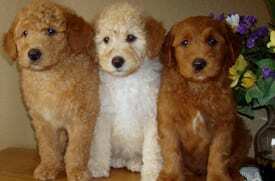 Labradoodles are a huge part of our life and would love to share more information with you. If we have not answered all of your questions about our dogs or our program on this website, please contact us and we will respond to your questions in a timely manner. If you have not heard back from us within 48 hours, please email again. MONDAY – FRIDAY we will typically reply to emails between 8 a.m. and 12 p.m., but it may take up to 24 hours for a response from us as we give our current puppies the best care possible while they are with us. WEEKENDS and EVENINGS we set aside for our family and off hours. While we may respond to an email during this time do not expect it. We will respond to emails as soon as we are back in the office. We try to keep all of our communication to emails only which allows us to respond to everyone’s questions quickly and thoroughly, and to have a written trail of all correspondence. We will answer all questions in a timely manner. This is helpful and necessary for tracking details and information along the way. We’d love to hear from you, and hope you’ll contact us soon!